Marcus Fernaldi Gideon and Kevin Sanjaya Sukamuljo’s conquest of HSBC BWF World Tour honours continued into another year as they captured the men’s doubles title at the PERODUA Malaysia Masters today. 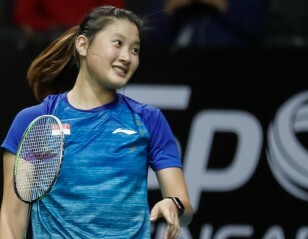 Gideon and Sukamuljo, who won eight World Tour tournaments last year, were never in trouble against home duo Ong Yew Sin/Teo Ee Yi as they eased home 21-15 21-16. “Next week is more important for us as we will play in Indonesia. But we don’t want to think too much and we’ll try to enjoy the game,” added his partner. Japan won the other two doubles through Yuki Fukushima/Sayaka Hirota (women’s doubles) and Yuta Watanabe/Arisa Higashino (mixed doubles). There was one Japanese obstacle too many for Greysia Polii and Apriyani Rahayu to cross in the women’s doubles final. 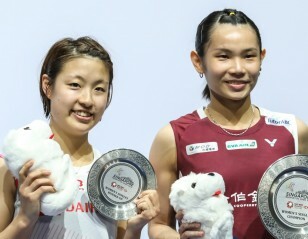 The Indonesians had beaten Misaki Matsutomo and Ayaka Takahashi after seven losses to Japanese opponents in semifinals since July; Fukushima and Hirota however denied the Indonesians the title with yet another solid performance for which they are renowned. Polii and Rahayu had things going for them in the early part of the match, and with Fukushima looking rattled, the Indonesians grabbed the opening game. But it increasingly got difficult for them with both Fukushima and Hirota settling down into their steady, error-free game. It was an even battle with Fukushima and Hirota being marginally more consistent in the final analysis, a point Polii conceded: “We played tough, but they were stronger than us. They were more consistent. Physically also they were a bit stronger than us today. “We were able to execute what we planned. But against them, you have to be in very good condition physically, mentally and technically. They’re quite the same as Misaki and Ayaka, they’re just as hard to beat. If they are at a level of 700, for instance, we have to be at 1000. You have to maintain that kind of energy against them. Yuta Watanabe and Arisa Higashino captured the mixed doubles title with an efficient performance over Thailand’s Dechapol Puavaranukroh and Sapsiree Taerattanachai, 21-18 21-18. The Thais had handy leads in both games but failed to capitalise. From 15-10 in the first, and 14-8 in the second, Puavaranukroh and Taerattanachai let the advantage slip.